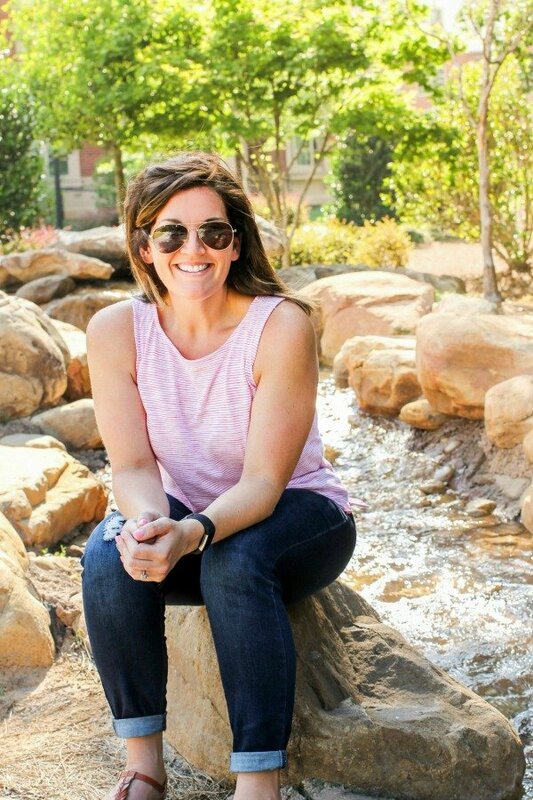 March 10, 2016 By Allyson Leave a Comment This post may contain affiliate links. Read my disclosure policy. Loaded Veggie Cheesy Pasta Bake – 20 minutes for this wholesome family meal! As most of y’all know, I am obsessed with pasta – I like to refer to myself as a pastatarian, in fact. 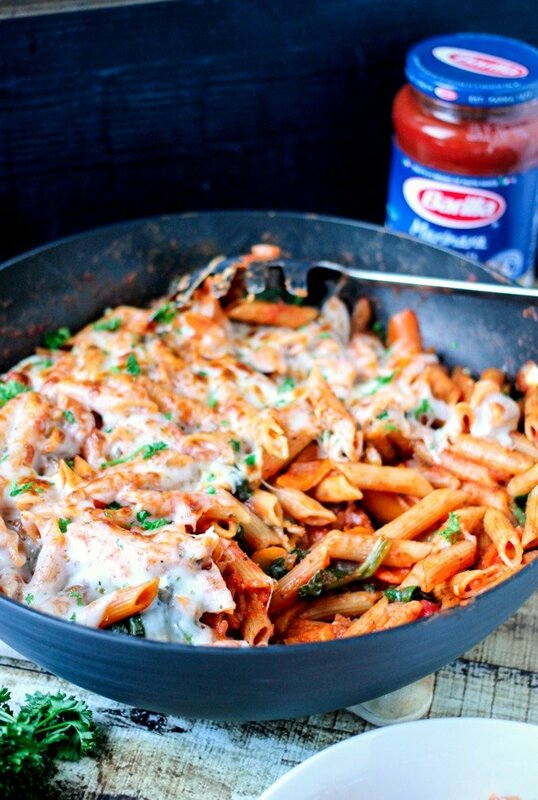 Cover it in sauce, in cheese, mix in some veggies…how could you go wrong? You can’t. Repeat again, you can’t go wrong. 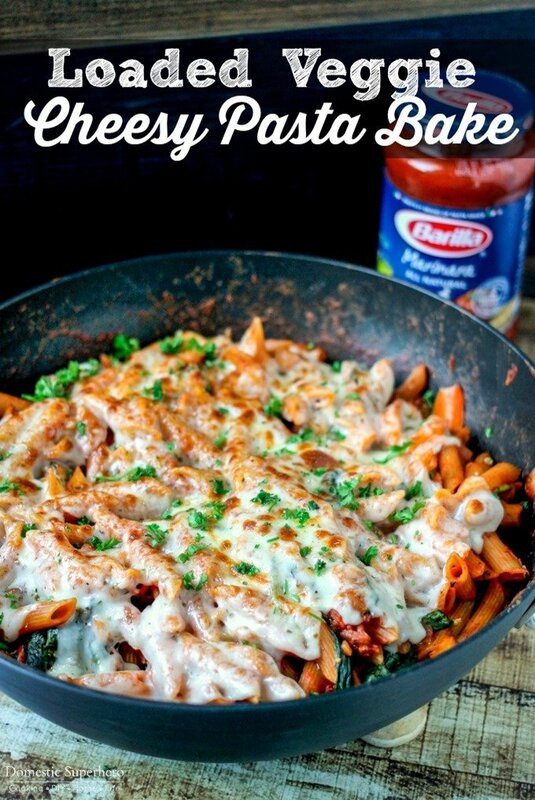 This Loaded Veggie Cheesy Pasta Bake is full of delicious fresh veggies, covered in an amazing Barilla® Marinara Sauce, and then smothered in mozzarella cheese. I’m telling you, it doesn’t get any better than this folks! I don’t know about you, but when I get home from work, the last thing I want to do is cook dinner. I usually head to the gym right after work, and then by the time I get home, I am so tired. Having a meal like this, where it’s super easy and full of vegetables, is essential at my house. That’s why keeping Barilla® Organic Spaghetti and Barilla® Marinara Sauce on hand, is so important! The Barilla® Pasta is made with certified organic wheat, no gmo ingredients, and always al dente with delicious taste. The sauce is made with real vegetables, it’s all natural, and gluten free. This is the first time the marinara sauce has been available in a 4-pack at BJ’s which is very convenient! Want to see exactly how this recipe comes together? Check out this quick video! For this recipe, I used the Barilla® Organic Penne, because I love how it works with the vegetables. 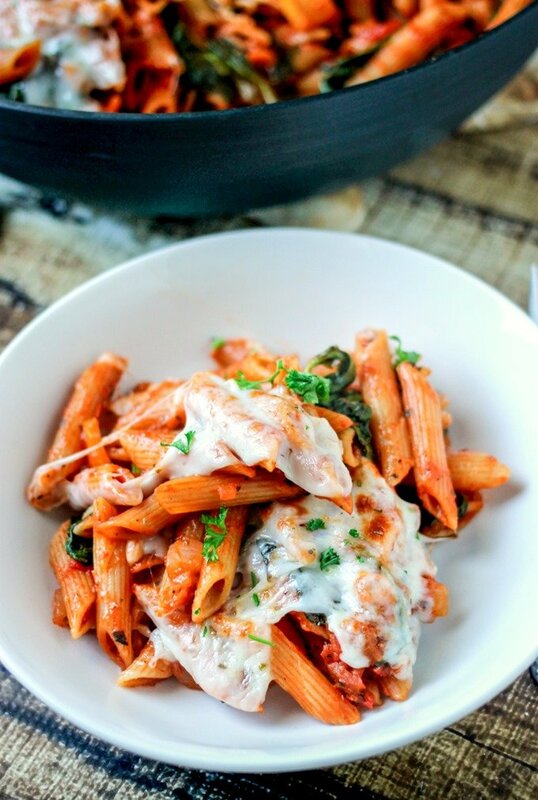 I can easily get a forkful of pasta, veggies, and cheese! 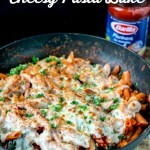 If you need a quick and easy weeknight meal, this is perfect! It’s definitely the type of meal that you can feel good about feeding it to your family. It’s simple, wholesome, and only takes about 20 minutes from start to finish! 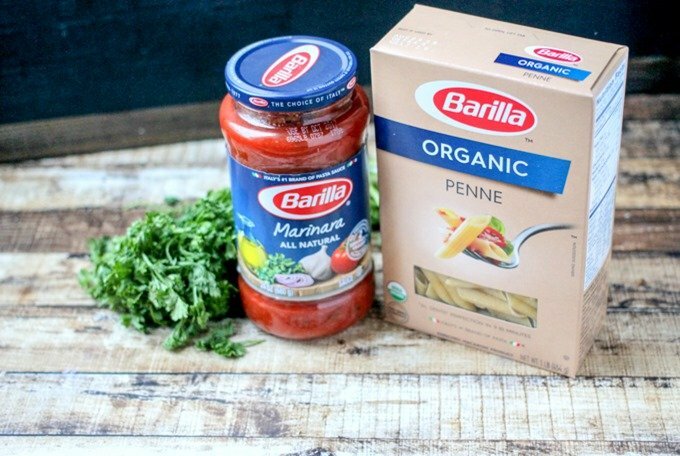 For more information about the Barilla® Organic Pasta and Sauce, visit their website. In a large skillet or pot, add olive oil, onions, and garlic and saute over medium heat for 2 minutes. Add chopped bell peppers, and saute for 2-3 more minutes. Sprinkle red pepper flakes, oregano, salt and pepper over the vegetables, stir. 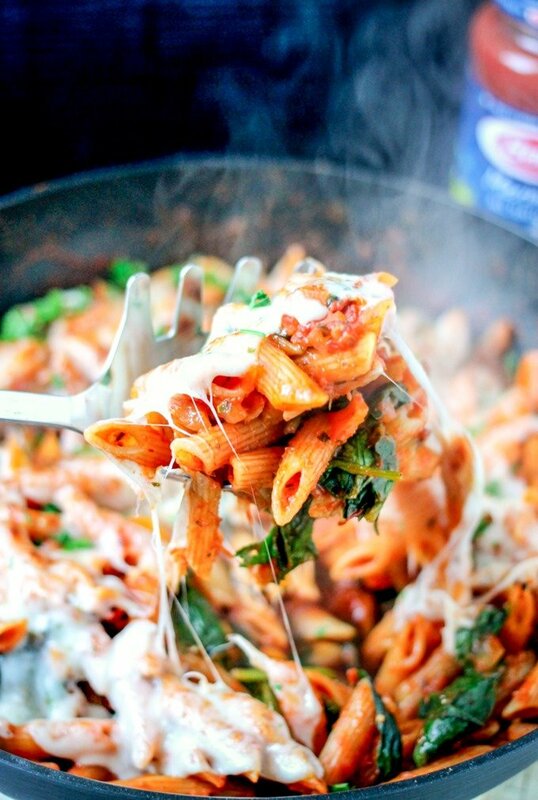 Add the entire jar of Barilla® Marinara sauce, water, and Barilla® organic penne; stir to combine. Bring the liquid up to a boil, reduce heat to a simmer, then cover. Cook for 12-15 minutes, or until al dente, stirring occasionally throughout. Add baby spinach leaves, cover and let steam for 1 minutes, then stir into the pasta. Sprinkle cheese over the top of the pasta, place under the broiler and cook for 1-2 minutes, or until cheese is melted, browning and bubbly. Remove, sprinkle top with chopped parsley.